Right-wing pundit Scottie Nell Hughes appeared on CNN this morning to opine that if someone votes for Hillary Clinton merely because she’s a woman, that is vile sexism. “Why sit there and put favor on one [group]?” Hughes wondered. Now look at what fellow panelists Sally Kohn and Michaela Angela Davis did while she was talking. Look at the actual pain on their faces. Last night was historical. Let’s put it in the history books. But if a woman walks into the voting booth and pulls that lever for Hillary Clinton just because she’s a woman, that right there I think is sexist. Last night we had a great opportunity—and Hillary Clinton, when she was in that room of girls, as you addressed—said, “If you’re a daughter or if you’re a girl, you can be president too.” This would’ve been an excellent opportunity to say, you know, “Whether you’re a boy or you’re a girl, both of you, my job will be to make sure it’s equally an option for both of you.” That’s the problem. We continue to say we want equality, we want equal, but we then tear down one group and try to build up another. “Was Hillary Clinton tearing down men?” CNN host Carol Costello asked gently. That’s the problem right there: we’ve done too good a job making women into presidents and now small boys don’t believe in themselves. That’s it. 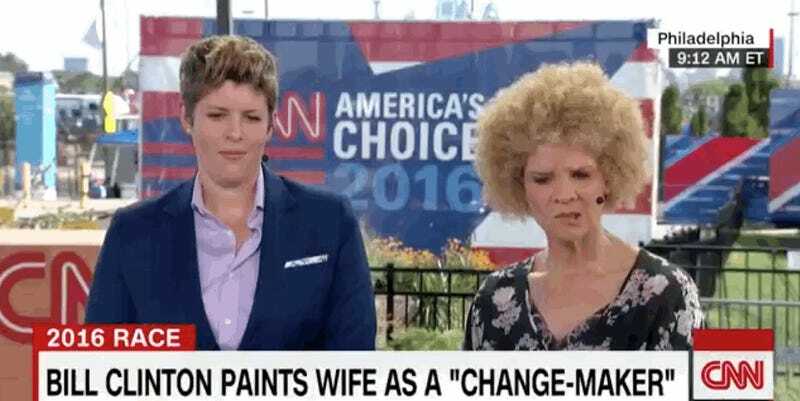 Now, if you will, turn your attention to CNN commentator Sally Kohn, who’s very liberal, and Michaela Angela Davis, who writes about race, gender and politics. Please look at them bow their heads together as Hughes is talking, at the 42-second mark in the video above. Please look at Davis as her mouth drops open and then she quietly takes Kohn’s hand. This is two very polite women digging down deep and asking their higher power for strength. Kohn and Davis did their best. There is truly nothing like watching a remedial Gender Studies 101 course play out on national TV. A banner week all around.